Thank you for your long patience during the month of August – the editor both spent the time moving and pursuing new careers. However, it is with a heavy heart that we will be taking a more extended break to pursue our respective research and work. We cannot, with confidence, note when we will return to writing. However, we hope that you will continue to follow news from North Korea and keep a close eye on the political, social, and economic developments on the ground. We look forward to returning to blogging in the future, but better yet we hope that the country’s opening is just around the corner and the need for analysts to sift through the opaque information will no longer exist. Very best to you all and thank you for a wonderful three years. The Rice & Iron team. Thank you for all your support and patronage this year. We are working hard to bring you quality analysis of developments in North Korea and will continue to strive to be a leading voice in this field. We would like to take this opportunity to announce that both editors will be taking a break in August. They will return in September with fresh materials, working from a new office and engaging in collaborative work with other North Korea researchers. This break does not mean that we will be unreachable – if you would like to contact the Rice & Iron team, please write us at nkfoodblog@gmail.com or give the editors a shout out on twitter @wslafoy and @ykwon88. Rice & Iron team has been interested in the city of Hyesan for a long time. While rice prices in this border city are often higher than those in Pyongyang and Sinuiju, Hyesan has traditionally enjoyed lower price volatility relative to the capital. This phenomenon can be most likely attributed to the city’s intimate trade relations with China. While this usually meant a more stable supply of food in the city, recent events also show that this relationship alone may not protect the city from wild fluctuations in prices. The volume of goods entering North Korea through Hyesan is most likely lower than the amount imported via Sinuiju; however, the distance between Yangkang Province (which Hyesan is in) and the capital also provides many opportunities. According to sources inside North Korea, alongside the critical supply of rice imported through Hyesan, the city also acts as an important entrepot for smuggled goods which spur North Korea’s budding consumer economy. Imported Chinese grain are usually mixed in with domestic rice by vendors in public marketplaces due to consumer preference for more glutinous characteristic of domestic rice. Nonetheless, recent measures granting greater price autonomy to shop owners have boosted sales of Chinese rice at public market places as retailers lowered prices to better compete with rice sold at the jangmadang. The positive effect of this market process was reflected in market data collected by Daily NK which noted a 250 KPW fall in rice prices from June to July (standing at 4800 KPW in Hyesan between July 12 and 18). The Korean People’s Won (KPW) has also been gaining in strength since May vis-a-vis the US dollar, no doubt improving the import capabilities of the North Korean market. Despite these positive developments for domestic consumers, insider information gathered by the Daily NK noted that rice prices in Yangkang and North Hamgyeong provinces have been increasing, reaching 6,000 KPW per kilo in some parts. Although price spikes in North Korea are not unprecedented, the Rice & Iron team had not read of reports of a 1000 KPW week-to-week jump since prices stabilized in early 2013. The Daily NK article that reported the event presented several possible reasons for why the price increases may have occurred. The first hypothesis appears to have been largely dismissed by the internal source as prices in cities near mining operations (like Masan) remained high despite the workers there receiving rations. The remaining hypotheses all carry some weight; however, the reports of the price increases appear (for now) limited to the northeastern parts of the country – the absence of similar stories coming from other peripheral areas like Kangwon Province render us unable to critically analyze this recent development. Meanwhile consumer attitude in North Korea appears divided on near-future market movements. Some people in the affected regions are concerned that prices may climb even higher, to 7000 KPW, as they expect the flooding from the monsoons to negatively impact the upcoming harvest of barley, corn, and rice. On the other hand, many also remain optimistic that the bump in domestic food availability at the end of the lean season will bring prices back down. As a detail to add to the logistical maps we put up a little while ago, we put together all major border crossings from the PRC and Russia into the DPRK. When assessing the trafficability of the DPRK and how useful it would be either as a shipment corridor for the ROK or as an active participant in trade, its important to figure out how porous it actually is. This map only includes locations that are visible in current imagery in Google Earth. Not included are broken, but repairable, bridges or potentially trafficable dams. The included sites all appear to be capable of carrying commercial traffic, with the exception of a rough site immediately east of Mount Baekdu. As mentioned in the key, red sites are exclusively rail crossings, which are the Russia-DPRK crossing near Khasan in the East and the PRC-DPRK crossing in Chongsu. Blue sites are exclusively road access. Purple sites are rail and road crossings. Sinuijiu has a bridge hosting rail and road, while the other sites have nearby, but still separated, road and rail bridges. The single green point is a rural, unpaved road crossing on the DRPK side, though the Chinese side appears to be paved in parts. Zoomed out slightly for better context: While our logistical lines represent the broad corridors for shipment, Curtis Melvin over at NK Economy Watch and USKI has painstakingly outlined the actual rail paths in his fantastic NK Uncovered project. Interestingly enough, there is a railroad line running through Kanggye and Chongsu in the western portion of the country. On the PRC side, previously this had just looped back into the same line that runs into Sinuijiu. Now, with the PRC’s effort at modernizing and expanding northeastern railroad lines, the Kanggye/Chongsu rail does extend deeper into southeastern Liaoning, though lack of modern imagery means we do not yet have a complete visual map of this line. As we chart out the PRC’s northern train lines, hopefully the imagery for this region will update and allow us to fill in some important logistical holes. 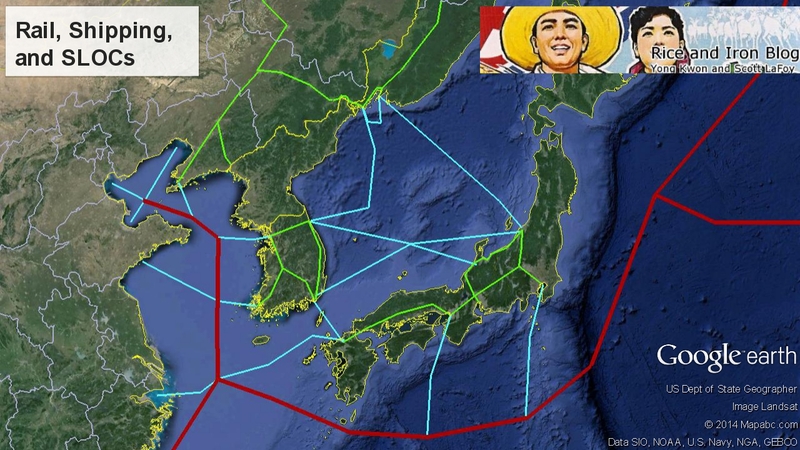 The important message to take from these maps is that the DPRK is fairly well connected into the regional rail networks and has been since at least the Japanese Colonial Era. While modernization would certainly be necessary, the base infrastructure is in place. Rail runs through all major corridors in the DRPK, with at least two trans-peninsular lines, one running along the belt between Pyongyang and Wonsan, and a second that follows the rough and meandering PRC-DPRK border on the DPRK side. We have not included this in our major logistical lines map yet, as we do not know that it actually would play a significant role in shipping, especially compared to the more efficient-appearing beltline farther south. Either way, as mentioned previously, if the DPRK opted to participate in trans-peninsula shipping, it would open two massive corridors for the ROK to utilize, allowing much faster access to the Trans-Siberian and Trans-Manchurian lines, and, by extension, the rest of Asia and Europe. From these maps, it should be obvious that highways and roads are our next mapping focus, as they make up the majority of border crossings. We continue to assess cargo and energy ports, as well. Hong Won Choi over at NK News has an article about the port at Rajin expanding its capacity, and the NK News Ship Tracker is a good resource for visualizing known DPRK affiliated or related ships within range of public-data-submitting AIS beacons. All things to keep watch of. We will continue to refine and update the maps as we parse through all the data we’ve been amassing. Last July, we provided an assessment of the yearly changes in rice prices and speculated on what the movements revealed about the market conditions in North Korea. In that article, we noted then that the nominal price of rice had been declining since April 2013 and that the fluctuations from July 2012 to July 2013 were much lower than the price increases from July 2011 to July 2012 (178.95% to 1.89% in Pyongyang, 126.32% to 29.07% in Sinuiju, and 150% to 12% in Hyesan), indicating some degree of price stabilization. At the same time, we highlighted some of the unknowns. Especially regarding wages and accessibility. There is also the constant question as to how well the prices in Pyongyang, Sinuiju, and Hyesan reflect the rest of the country. 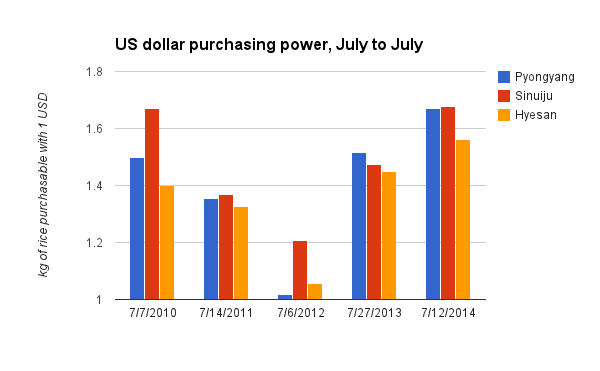 One set of figures that we underscored last year was the U.S. dollar’s purchasing power vis-a-vis rice, which had continued to increase from July 2012 (48.86% increase in Pyongyang, 22.11% in Sinuiju, and 37.14% in Hyesan). We read this growth as an index for the continuing lack of confidence in the Korean People’s Won (KPW) by North Korean consumers. We took another look at both the rice prices and the purchasing power of the USD this year, hoping to get a better picture of broader trends. 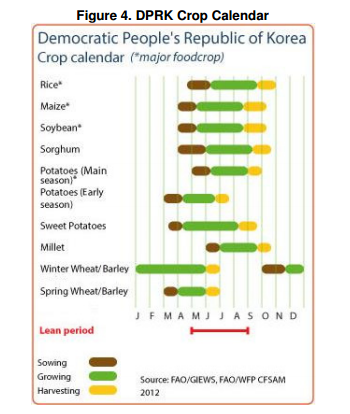 July was initially selected last year because of it falls in the middle of the lean season in the North Korean crop calendar. We believe that conditions now, when food availability would be most strained in the country, best reveals the robustness of the overall food market. 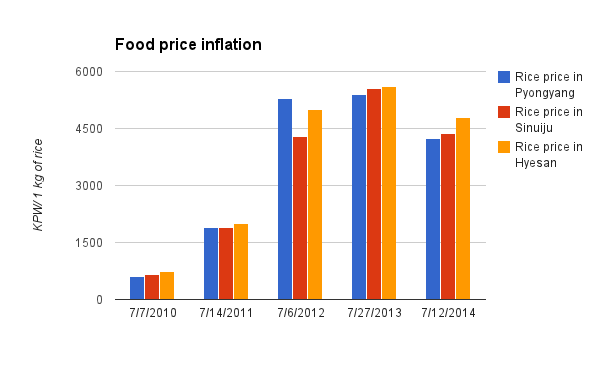 According to the data collected by Daily NK, the nominal price of rice in all three cities fell year-to-year in 2014. Compared to July 2012, the price changed by -21.296% in Pyongyang, -21.081% in Sinuiju, and -14.286% in Hyesan. 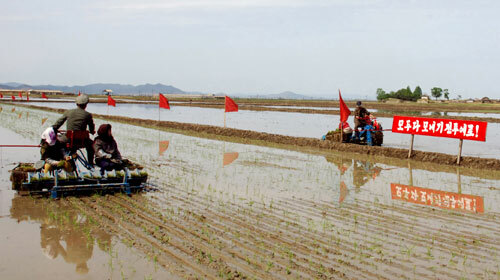 It is also noteworthy that rice prices in Sinuiju and Hyesan fell to price levels from July 2012 while prices in Pyongyang fell an additional 20.755% compared to that from two years ago. However, these nominal prices do not reflect real purchasing power, so additional data must be examined. We examined the purchasing power of foreign exchange in previous articles and consider it a very important indicator of the price stability in the country. The year-to-year decline in rice prices outpaced the recovery in the KPW’s value and produced an increase in the USD purchasing power vis-a-vis rice prices. Although the purchasing power of the USD had come down from its all time highs between December 2013 and April 2014, the stark difference is visible when we compare figures from 2012. Although nominal prices of rice had come down to levels from 2012, the increased purchasing power of the USD in the past two years suggests that foreign exchange has become more valuable. There is still not enough information to affirm what this phenomenon means to food security in the country. However, as we emphasized in the past, the rise in the purchasing power of the USD does not bode well for North Korea. The accessibility of valuable foreign exchange varies from place to place and ultimately harms the powerless. Meanwhile, the drastic decline in nominal prices in Pyongyang may also indicate that resources are continuing to concentrate in the capital. This post is based on an informal talk I gave about a year or so ago for a professor at Georgetown, as well as some backseat research Yong and myself always are adding to. The notion of an economically and logistically integrated bloc in North East Asia has been a desired and pursued goal for numerous national actors over the past century. Imperial Japan in particular sought to industrialize and integrate its colonial holdings and dependencies in China and Korea to support the Japanese Home Islands. The Dongbei/Korea/Russian Far East/Mongolia area, sometimes referred to as the Greater Tumen Region or part of the Greater Tumen Initiative, is a massive region known for its mostly untapped mineral wealth (though this is changing) as well as its tense and frustrated politics. The countries most publically associated with the Greater Tumen Region, at least in the West, are the People’s Republic of China, the Russian Federation, the Republic of Korea, and Mongolia, as these four players are the most economically active. The obvious fifth player in this region would be the Democratic People’s Republic of Korea. North Korea’s border is literally made up, in part, by the Tumen River, so everything about this economic region involves or could involve North Korea. Our friends over at Sino-NK have an excellent project about the Tumen River initiatives very much worth reading. Integration of the DRPK into a greater Tumen regional economic bloc would likely be profitable for most, if not all, players. With the DPRK’s recent foray into petroleum exploitation with Mongolia, the Russian Fed’s new rail line to Rajin, and the lengthy rumors and discussions of everything from inter-Korean railroads to inter-Korean gas pipes, along with the forgiveness of 90% of the DPRK’s Soviet era debt to Russia, indicate that the DPRK may be slowly integrating into a Tumen regional bloc. Determining the trade volume and profitability of this venture are are ongoing and possible overwhelming project for us, but in the meanwhile, we’ve worked out some of the theoretical logistical networks that the DPRK would create if it went all-in and opened up for trade and transit. This is an ideal logistical situation that could be worked towards in the future, but is obviously out of reach for the time being. These maps represent a work-in-progress of a larger analysis of the Greater Tumen economic region, and are to be treated as drafts of future, polished maps and analyses. This first map is just a simple approximation of the local sea lines of communication. The entire Chinese seaboard and the eastern coast of Japan have massive trade volume. We have elected not to include the Sea of Japan routes as a major SLOC, as it is covered by the massive local trade routes in the next map. 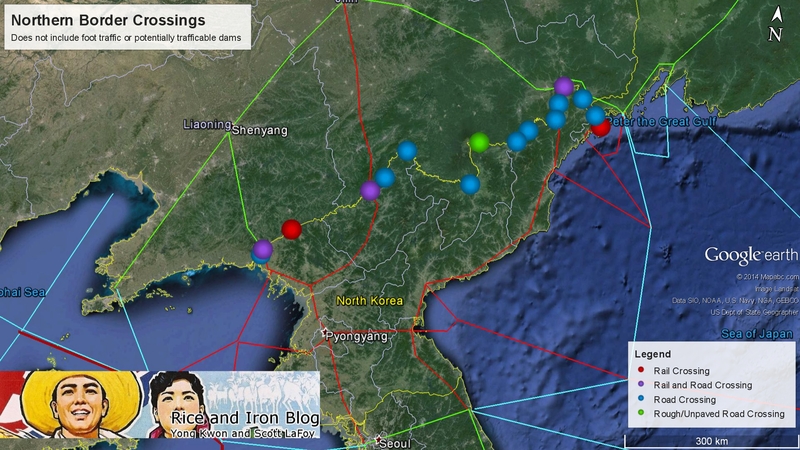 Next we have added in the major non-DPRK rail and shipping lines. These are the main trade lines that we are considering part of the Greater Tumen coastal area. Western Japan has the Niigata-Kitakanbara cargo area and the Kanazawa container ports, which have easy access to the entire Korean and (mostly) ice-free Russian Far East coast, making it a vital hub for any materials heading into or through Japan. Like all major Japanese ports, this area is integrated into the Japanese rail network. Any cargo bound for the US can pass through the straits near Hakodate, however, and be off towards Hawaii with relative ease. Vladivostok is the most important Russian port in the region, being (mostly) ice-free and having a large container capacity. Not visible is Nakhodka, a cargo and coal port east of Vladivostok, but too close to be clear in this map. Zarubino is located closer to the DPRK and major Japanese ports, but more food oriented, and doesn’t seem to have significant container capacity. It is still important for food export and import though, so it has been included as a potentially important regional port. The coal port of Posyet has also been visually excluded due to its proximity to Zarubino, though should be included in any Tumen regional bloc. All of these ports are integrated into the Russian rail networks, meaning that there is a near uninterrupted rail line from all of these ports all the way to London, England. The Chinese coast is filled with important and high-capacity ports. To name a few, the ports at Tianjin, Dalian, Dandong, and the myriad ports in Hangzhou Bay around Shanghai play an important role in the Tumen region. Even without a Greater Tumen regional bloc, these ports are vital to the Chinese and world economy, and even the DPRK’s trade ships pass regularly through these ports. As well, each port is integrated into China’s rapidly developing rail network, which in turn feeds into the Mongolian and Russian networks, allowing for near uninterrupted rail service all the way to London. However, the stumbling bloc in this region is the DPRK and access to the ROK. Busan and Incheon are incredibly busy ports, and the ROK economy imports and exports a tremendous amount of containers per year. While the PRC is the ROK’s number one trade partner, and the distance by water is fairly minimal, the constant friction caused by the tense politics surrounding the DPRK in addition to the steep operating cost of ships still makes trade expensive. If the DPRK were to fully integrate into the Tumen bloc in the future, not only could the ROK trade with the PRC over land, but the ROK would have direct rail access to Europe, significantly lowering the cost of long-distance trade. 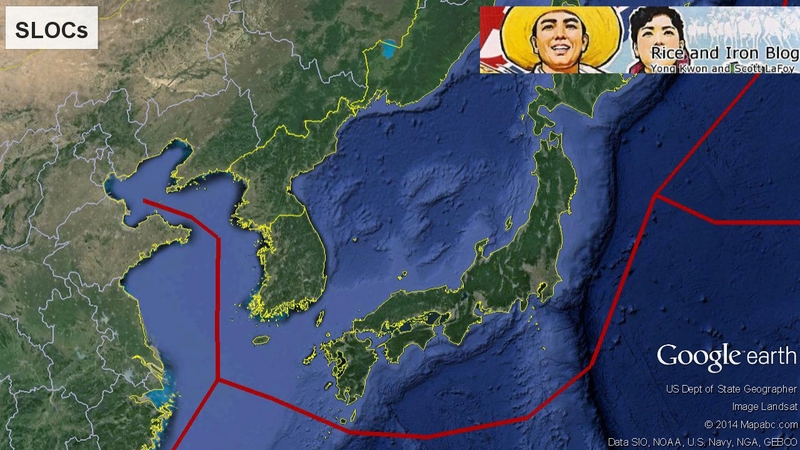 DPRK inclusion and integration greatly simplifies shipping for the ROK and Japan, greatly minimizing sea-based transportation and allowing for swift overland transport to Europe. With a line from Busan to London, goods that required inputs from Korea and Japan wouldn’t have to hop between so many ports before being shipped to market. The DRPK likely understands the benefits of integration and, at a minimum, the ability to impose taxes and tariffs on ROK trains running through to the Chinese and Russian rail networks. As we pull together more trade numbers, we hope to eventually produce a map that includes the trade volume and an estimation of at least some of the cost difference for an overland route from Busan to London, but include some of the energy opportunities that will arise. As the DRPK and HBOil continue their oil deals and the DPRK connects Rajin into the Hunchun area power grid in Jilin, the flow of electricity into the Rajin area and the flow of petroleum and refined products out will be critical, albeit controversial, steps in integrating the DPRK into the region. Tying Mongolia and the DPRK together will necessarily require infrastructure from the Russian Federation and PRC in the form of roadways, railways, and, possibly in the future, gas and oil pipelines. In addition to the PRC and Russian Fed port deals in Rajin, Mongolia’s investment in oil infrastructure represents one of the highest profile Tumen regional bloc investments, as it requires primary and secondary economic inputs and supports from all the mainland regional actors and, if successful and unopposed by the US, ROK, and UN, could possibly be one of the first cases in decades of major industrial integration of the DPRK with the rest of the region. Regardless of success, failure, or sanctions, we will continue to refine our currently rough maps and eventually produce a functional logistic and economic integration map of the Tumen region. Definitely an area to keep watch on. It has been 20 years since the death of Kim Il-sung and North Korea is still reeling from the consequences of his economic mishandling. 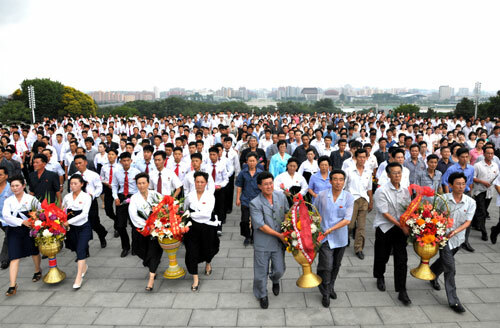 However, many North Koreans appear to have fond memories of the Kim Il-sung era, perhaps because it was a time period marked by relatively good economic conditions compared to the famine years that immediately followed Kim Il-sung’s death and the economic turmoil that had defined the Kim Jong-il and Kim Jong-un eras. Of course, the North Korean state is also aware of the fact that the ongoing economic difficulties reflect poorly on the current leadership. Thus it is little surprise that the state-run Rodong Sinmun often emphasizes the fact that Kim Jong-il did much to establish industries for “high-quality” consumer goods. But for whom are these articles written? It must be for those who actually have access to high-quality consumer products so that they can attribute their good fortune to the late leader. Then this leads to the question of how big this consumer demographic is in North Korea. South Korean newspaper Chosun Ilbo remembered the passing of North Korea’s founder by publishing excerpts from interviews conducted with 100 North Koreans currently living and working in the Chinese cities of Dandong and Yanji, across the border from North Korea. Their testimonies revealed interesting insights into the conditions in the country. One aspect of North Korea that was repeated throughout the interviews was the growing urban-rural divide in the country. Many criticized the concentration of wealth and resources in Pyongyang and one interviewee went as far as to state that conditions outside urban zones were no better now than they were during the famine years. One interviewee, who identified him/herself as being from Kangwon Province, also noted that no visible changes had taken place since the transition of power to Kim Jong-un. When asked about experience conducting business at the jangmadang, 70% of the interviewees admitted to having traded at the informal marketplaces. Many told the interviewers that it was a matter of necessity as an average monthly wage for a laborer was about 3000 KPW. The most recent market data from North Korea gathered by Daily NK notes that rice prices (between June 14 and June 20, 2014) in Pyongyang stood at 4300 KPW while in Sinuiju and Hyesan, they were 4500 and 5050 KPW respectively. This means that a North Korean laborer would not be able to purchase 1 kg of rice at market price with a month’s wage. Complementing their wages with commerce at the jangmadang, interviewees revealed that there was a lot of absenteeism in manufacturing plants. It is apparently commonplace for the workers to get their cards stamped in the morning at the factory and then immediately go to the jangmadang. At the same time, it appears productivity of the manufacturing plants other than those in Pyongyang or other major cities have long ago ground to a halt due to material deficits. Some interviewees noted that many workers have resorted to stealing machinery from these plants and selling for scrap iron. These economic conditions have induced many North Koreans to seek work across the border in China where one could make 1800 RMB a month doing dishes in a restaurant. Although the official conversion rate from RMB to KPW (1 : 145.04) suggests that 1800 RMB is equivalent to 261,071.54 KPW, if you consider that 1800 RMB is about $290.06 (US), then by the current Pyongyang street exchange rate (1 USD : 7300 KPW), the actual figure is probably closer to 2,117,438 KPW, a value equivalent to 492 kg of rice in Pyongyang. However, as interviewees with experience in commerce highlight, much of the people’s income from jangmadang or remittances from China go towards bribing party cadres and security personnel. The overall picture painted by these interviews is not one that readers of North Korean affairs are unfamiliar with – nonetheless, details on the fragility of the North Korean industry and on the attractiveness of finding work in China provide greater context for the country’s ongoing struggle to keep its economy and currency afloat.